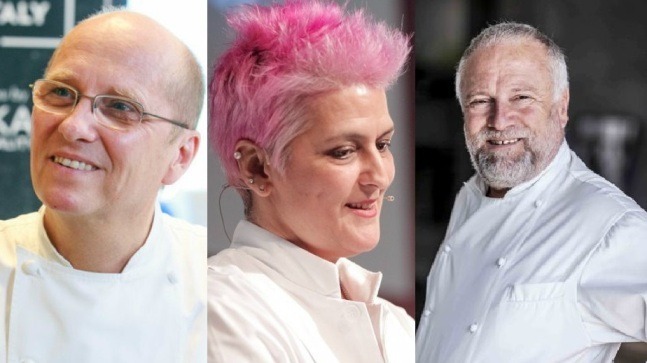 Starry Chefs Heinz Beck (La Pergola), Cristina Bowerman (Glass Hostaria) and Antonello Colonna (Antonello Colonna Open) land in Leonardo da Vinci Airport, the first of Rome. Beck has opened “Attimi by Heinz Beck” with Chef Express, Cremonini Group’s Company that manages the restaurant business, in the “food court” of the new Molo E of Terminal 3 for extra Schengen flights. Attimi is an high level restaurant with 70 seats that offer “time menus” of 30-45-60 minuts, adjusted to the time that the customer can pass pending departure. You can eat “fast” but with a quality “slow”, is the slogan.There is the possibility to take a single plate in a few minutes, or even order take away. At Molo E has also opened “Assaggio” by Autogrill. It’s a wine and fish bar with table service where you can enjoy the food offer supervised by starry chef Bowerman. She has also signed three of the menu recipes: 65° pan with egg, mozzarella di Bufala Campana DOP and potato; mezze maniche pasta sleeves of romesco sauce, mozzarella water and almonds; avocado squared, trout, red pepper, tomatoes, sesame seeds. Wines are selectioned by ZONIN1821. Colonna’s “Open Bistrò”, instead, is situated in Terminal 1 (gate B7). As Antonello Colonna Open’s lunch at Palazzo delle Esposizioni, chef Colonna presents his cousine with a buffet “all you can eat”, for a fast but foodie lunch. Restaurant is an art gallery too: inside there is a space dedicated to exhibitions of photography and contemporary art. Also Open Bistrò is realized with the collaboration of Chef Express.